1. 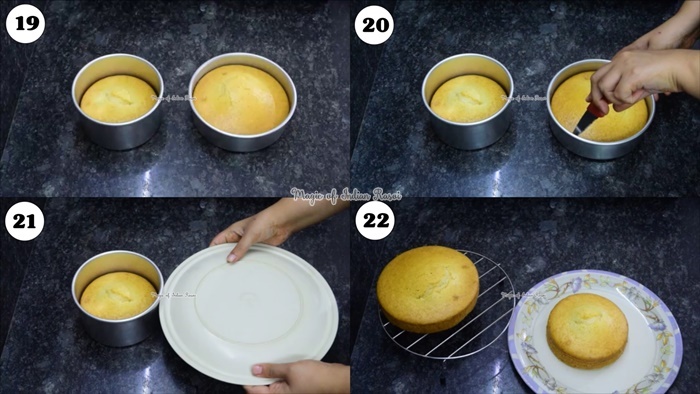 Grease a 6 inch & 4 inch cake mould (or use single 8 inch cake mould) with oil and place parchment paper at the bottom of the tin. 2. Preheat oven at 150C for 10-15 mins. 3. 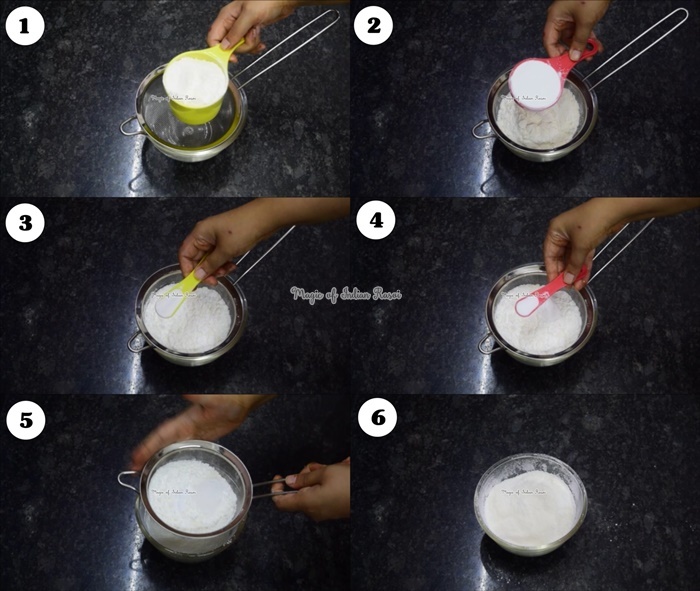 In a large bowl, sieve together all purpose flour, corn flour, baking powder & baking soda. Keep it aside. 4. In another large bowl, whisk condensed milk and powdered sugar until light & fluffy in texture. 5. Add oil & vanilla essence and whisk well until well combined. 6. 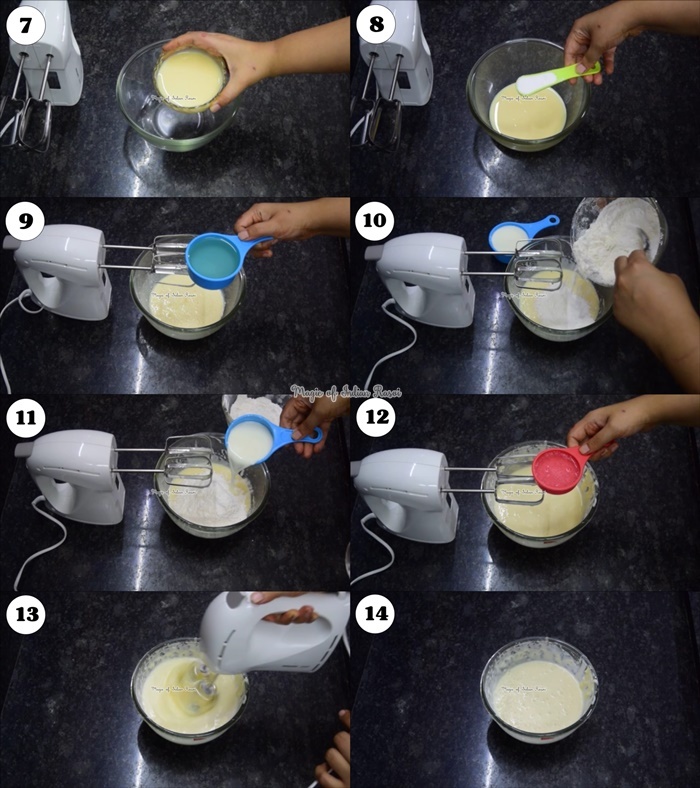 Add half of dry ingredients mixture & half of milk to wet mixture. Mix well. 7. Add remaining dry ingredients mixture & milk. Mix well. 8. Add soda water and whisk well. 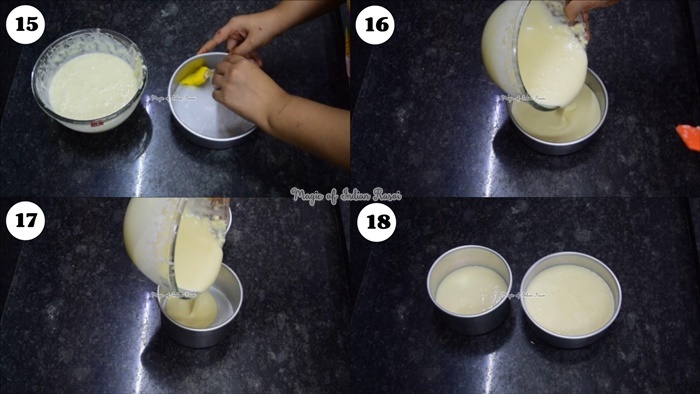 Pour this batter in cake tins till half way. 9. Tap gently on the kitchen counter to release any air bubbles. 10. Bake in pre-heated oven at 150C for 40-45 mins or until a toothpick inserted comes out clean. 11. Take the cakes out of the oven and leave it in cake tins for 10 mins. 12. After 10 mins, run a knife along the sides of the cake and gently un-mould the cakes. 13. Transfer the cakes to a cooling rack & allow the cakes to cool completely for 1-2 hours. 14. Cut into desired pieces or frost it as per your liking! Eggless Vanilla Sponge Cake is ready to serve! I tried the cake ..n it came out so yummy..but as u said I baked it in 8” tin n as a result it came good but didn’t gave the desired height so that I can cut it in half do icing ..I think it’s good for 6”tin only so v can get good height...n it gives a 1/2 kg cake..is it ?pl explain..can I double the ingredients to make a 1 kg cake for In 8” tin?